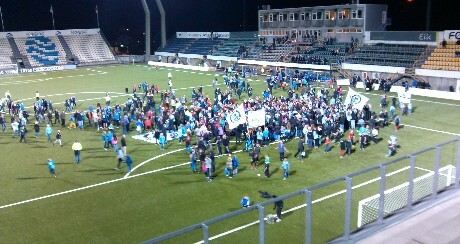 Víkingur win 5-4 on penalties, after an aggregate score of 3-3, after 2-2 in the first 90 minutes. EB/Streymur were in their sixth cup final in succession, having won the 4 of them; losing out to only Víkingur in 2009. Now they were defeated by the same opponents again in dramatic fashion. Víkingur started the match as the stronger team and had the early attempts, but eventually EB/Streymur started to threaten at the other end, and after 31 minutes Jónhard Frederiksberg poked in from the edge of the goal area to give EB/Streymur the lead after some terrific combinations leading up to the goal. Víkingur started strongly after the break and had three close attempts before they made one count after 54 minutes when Evrard Ble’s scissors kick from a corner was flicked on to Hans Jørgen Djurhuus who headed in from close range. After the equalizer, the game opened up and saw plenty of action in front of both goals and on 68 minutes EB/Streymur re-claimed the lead on a penalty from Levi Hanssen, after a shot from Leif Niclasen had been handled. The referee spotted another hand after 76 minutes, this time when a ball hit the arm of a sliding Marni Djurhuus, and Víkingur captain Atli Gregersen safely converted from the spot to restore parity again. 4 minutes into extra time EB/Streymur took the lead for the third time when Leif Niclasen scored with a looping shot after he was played clear in the penalty area by a genius pass from Arnbjørn Hansen, who had started on the bench as he has been nursing an injury for several weeks. 8 minutes after the goal, EB/Streymur’s midfielder Pætur Dam Jacobsen was sent off for a second bookable offence. Víkingur took full advantage of the extra man and pressed hard for another equalizer, and with 10 minutes remaining of extra time, Hjartvard Hansen forced a penalty shoot-out when he scored from close range after Fritleif í Lambanum had flicked on from a cross. After 10 penalties, it was still even, as both teams had missed one a piece. As Bárður Hansen then missed Víkingurs 6th penalty, EB/Streymur’s goalkeeper René Tórgarð was chosen to take what could be the cup-winning penalty, but he blasted the penalty well over and wide! Erling Jacobsen then scored for Víkingur before striker Arnbjørn Hansen missed EB/Streymur’s penalty to send the cup title to Víkingur in a first ever penalty shoot-out in a Faroese Cup final. Víkingur captain Atli Gregersen, who had levelled the match at 2-2 in ordinary time, misses his penalty in the shoot-out, but still ends up victorious as EB/Streymur failed to capitalize on the miss. See photos from the final in Víkingur's photo gallery ﻿here﻿.